Aqua therm heat exchanger can be used with distillation units. The hot water released from the Condenser outlet is usually let into the Sink, thereby wasting precious water. 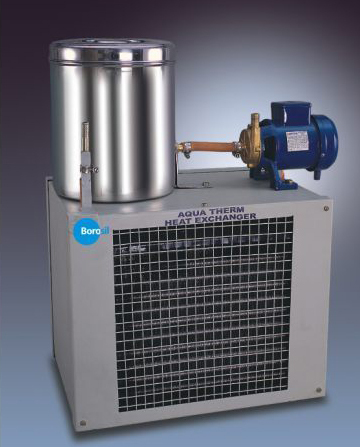 However, Aqua therm heat exchanger is equipped with cooling coils and fan that cool the hot water as it comes out and then pump it back into the Condenser inlet, thus saving water. It can be mounted on a table to occupy less space. The power consumption is minimal. It takes only 15 liters of water to run the distillation unit(single or double).